An artist's illustration of a Mars habitat and vehicle. 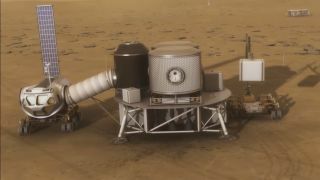 To help generate ideas about how to build housing on the Red Planet, NASA is hosting the 3D-Printed Habitat Challenge. The teams are competing in NASA's 3D-Printed Habitat Challenge, which is now in its second phase. The latest milestone required participants to print a structural beam that would undergo bend testing, with scores based on the use of recycled material or material like that found on Mars, and on the maximum load that the beam could support. "We are on the edge of developing new, innovative and disruptive ideas that could change our future. This type of work will allow us to explore new ideas as we partner in creating solutions for our world and beyond," Akers said. A 3D-printed beam by team MoonX of South Korea, which won first place in the Phase 2: Level 2 competition of NASA's 3D-Printed Habitat Challenge. For this level, teams had to 3D print a structure for bend testing. While shelters will likely be crucial to human exploration of other worlds, launching them from Earth presents two main challenges, NASA said. First, the habitat must fit inside a rocket payload faring; that limits the potential size of the habitat or requires that it be shipped in pieces. Second is the additional mass that must be launched, adding cost to a mission. One potential solution is to send autonomous robots to deep-space destinations like Mars to construct habitats before human settlers arrive; relying on local resources and recycled material to produce the habitat pieces would then reduce the launch cost, according to NASA. "Recyclable plastics were used in the top three scoring teams' [projects], indicating that a thermoplastic concrete material may be viable for 3D printing habitats on Mars," said Rob Meuller, senior technologist for advanced projects development at the Swamp Works laboratory at NASA's Kennedy Space Center in Cape Canaveral, Florida, and a subject matter expert for the competition. Thermoplastics are plastic polymers that become moldable when heated. According to Mueller, they could be obtained from discarded packing materials, or even created on Mars using the Red Planet's atmosphere and soil. Although the methods may seem out of this world, Mueller said they could also be used on Earth planet using discarded trash, providing a boon to areas where access to conventional building materials is limited or affordable housing is needed. Team Form Forge of Oregon State University, Corvallis, 3D printed this beam for NASA's 3D-Printed Habitat Challenge. The first-place team was Moon X Construction of Seoul, South Korea (international teams were not eligible for prize money). In second place was Form Forge of Oregon State University, Corvallis, which was awarded $67,465. In third place was Foster+Partners from Branch Technology of Chattanooga, Tennessee, which won $63,783; that team also won first place in the previous sub-challenge. In fourth place was the University of Alaska Fairbanks, which was awarded $35,573. In fifth place was the CTL Group Mars of Skokie, Illinois, which was awarded $34,202. In sixth place was Robocon of Singapore, another international team. A seventh team, from Pennsylvania State University, competed but did not meet the structural requirements for a cash award. The 3D-Printed Habitat Challenge is divided into three phases. Phase 1, the Design Competition, was completed in 2015. Phase 2, the Structural Member Competition, consists of three sub-competitions and focuses on the material technologies needed to create structural components. The just-completed segment is the second sub-competition. Phase 3, the On-Site Habitat Competition, will focus on automated 3D-printing systems that could autonomously construct a complete habitat. With the second part of Phase 2 down, the teams will now work on Phase 2: Level 3, which requires them to 3D-print a dome structure and provide samples for crush testing. Qualification is based on performance in previous levels. The event will be open to the public on Aug. 25 and 26.